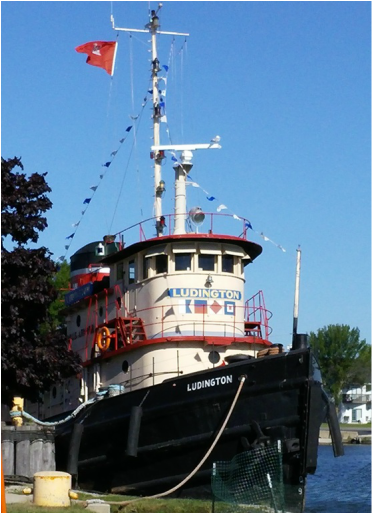 A piece of real American History - the Tug Ludington is right here in the Kewaunee Harbor, and is open for tours during the City of Kewaunee Marina business hours. The check point is at the Kewaunee Marina, located at 123 N. Main Street for the tours if no one is on site at the Tug. Cost for the tours are $5.00 for adults and $3.00 for school age children. All children must be accompanied by an adult. Built at Jacobson Shipyard in Oyster Bay, New York, the Tug Ludington was fourth in a series of eight seagoing tugboats constructed specifically for World War II in 1943. After sea trials it was christened the "Major Wilbur Fr. Browder" by the U.S. Army. The tug's armament consisted of two 50 caliber machine guns mounted above the chartroom and pilothouse. Tugs were often strafed by enemy planes and submarines, but were considered too small a target to waste a torpedo on. The tug participated in the D-Day invasion of Normandy, towing ammunition barges across the English Channel. It eventually ended up in Cherbourg, France where it assisted harbor operations until being sent to Plymouth, England for the duration of the war. In 1947 the tug was transferred to Kewaunee, Wisconsin by the U.S. Army Corps of Engineers and was renamed the "Tug Ludington.” With its arrival in Kewaunee, the Tug Ludington assisted in the construction and maintenance of many harbors on the Great Lakes. The City acquired the Tug Ludington from the Federal Surplus Program on December 29, 1995 with official transfer from the U.S. Government Service Administration Federal Surplus Property occurring on May 14, 1996. After acquisition, the City, community volunteers, and donations from both individuals and organizations evolved in the proper mooring facilities being constructed and restoration of the Tug Ludington to make it available for public tours. On March 28, 2002, the “Major Wilbur Fr. Browder/Tug Ludington” was placed on the National and State Register of Historic Places by the Secretary of the Interior. 1200 horsepower at 275 r.p.m. Manufactured by De Laval Turbine, Inc. This is a direct drive engine; there is no transmission. To start the engine it must be heated and then the fuel is turned on. Compressed air from the air tanks starts to rotate the engine pistons. Once the engine fires up, the drive shaft begins to rotate and this turns the propeller at approximately 275 r.p.m. To reverse direction the engine must be totally shut down with the fuel turned off.The camshaft control is moved and the camshaft slides by air to the opposite direction. The process to start the engine is started all over again with the exception of heating the engine.